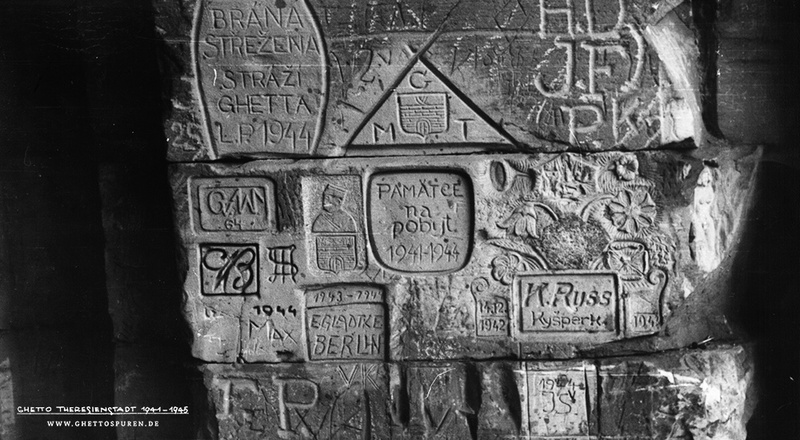 Between 1941 and 1945, countless prisoners engraved their messages into the sandstone walls of the Terezín fortress, the site of the former Theresienstadt Ghetto – and many did so just before going off to their deaths. By inscribing their names, initials, dates and pictures, they memorialized their own fates and acted as witnesses as well. But the inscriptions are in danger of disappearing. The project Ghettospuren.de is the first international project to document these remaining traces. 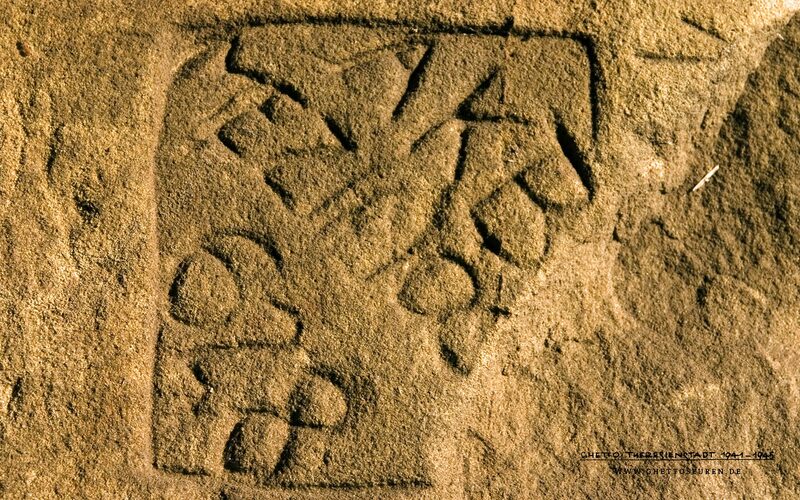 In a dark tunnel of the fortress gate, Poterne III, several square meters of the sandstone wall are embossed with traces: names, prisoner numbers as well as objects with deep symbolic meaning, such as a Chanukah menorah, star of David or portraits of a ghetto police member. Hard to miss are the oft-repeated dates 1942, 1943, 1944, a time when Theresienstadt, overcrowded with Jewish prisoners, was cordoned off from the rest of the world. A Jewish self-administration, controlled by the SS, was responsible for organizing ghetto life, including its own security force, the ghetto police. Members of the ghetto police were recruited from among the male prisoners. The job of those that were stationed at the Poterne III gate was to hinder escape attempts and curb smuggling. Several of them were the authors of the carvings and inscriptions seen at Poterne III. Many of them were deported to Auschwitz where they perished. In the decades following WWII, these traces went forgotten when Terezín was turned into a military garrison. Poterne III was again made accessible to the public in 2005, after closure of garrison. Urban planner and author, Ms. Uta Fischer became the first person to identify authors and meanings behind the inscriptions while working on her project, “Theresienstadt 1941-1945 – Materielle Zeugnisse und Spuren” (Theresienstadt 1941-1945 – Evidence and Traces). These extraordinary witnesses of the Holocaust are now online, together with interactive maps, at: www.ghettospuren.de. „This has been nothing less than true detective work. We’ve pieced the data together like a mosaic. Often, we had little more than name-fragments or numbers to go by,“ Uta Fischer said, describing the painstaking efforts behind her work. Many inscriptions were impossible to read, having fallen prey to erosion and vandalism. 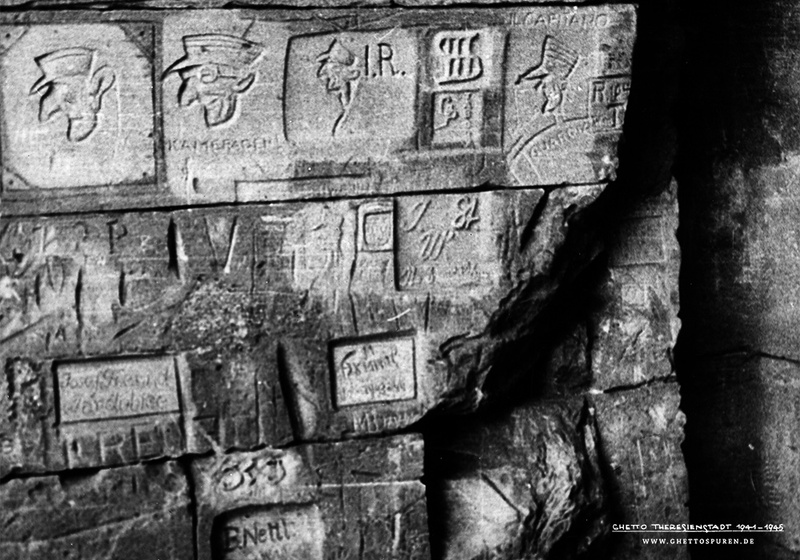 Only after the discovery of two photos taken by former inmate Jiří Lauscher in 1945, after liberation, could some of these inscriptions finally be deciphered. In the meantime, dozens of names and fates of prisoners could be identified and documented. „In the hopes of reminding future generations about their fates, these prisoners were somehow able to create this place of collective remembrance within the dark passageway of the ghetto gate“, Uta Fischer said. Since 2012, Fischer’s team of international experts has been documenting the last traces of prisoner life still to be found throughout the grounds of the former ghetto in present day Terezín. The future of Poterne III as a place of remembrance is threatened. Inscriptions located on the site’s most exposed areas have already gone lost only a few short years after the area was uncovered. „Now, after comparing recent photographs can we confirm how dramatic the erosion of the inscription-details has been. In three or maybe five years it will be too late. We’re compelled to take preventive measures now“, said Professor Thomas Danzl of the Dresden Academy of Fine Arts. Danzl, who is a project partner of Ghettospuren.de, is heading the restauration research team of Poterne III together with Professor Karol Bayer ot the University of Pardubice’s Conservation Department, located in Litomyšl. Although the first phase of Ghettospuren.de is coming to fruition, the documentation project will be continued. „The former ghetto is laden with nooks and crannies where many treasures from the past still lay hidden, waiting to be uncovered. Perhaps we will not succeed in saving all of the physical traces. But with the help of donor funding, we hope to continue documenting all that is still left to be documented. We hope that by building awareness we will be able to offset further deterioration“, Uta Fischer said. And what better way to build awareness than through the lens of the project’s photographer, Roland Wildberg. „We’re excited about all that there is still left to be discovered in Terezín’s attics, cellars and fortifications,“ Wildberg said. First step: click on image. Second step: place mouse-cursor on image. Third step: right-click the mouse and use the command “Graphics / save image as” to save the image on your computer. If you need the material in a higher resolution, feel free to contact us directly.